ພວກຊາວບ້ານໃນທ້ອງຖິ່ນ ຊ່ອຍກັນຂຸດເອົາຊາກສົບອອກມາ ຫຼັງຈາກ ບ້ານຫຼັງນຶ່ງ ຈົມຢູ່ໃນດິນທີ່ເຈື່ອນລົງມາທັບ ຢູ່ໃນເມືອງເມັນດີ ຫຼັງຈາກເກີດແຜ່ນດິນໄຫວ ທີ່ໄດ້ກະທົບ ເກາະປາປົວນິວກີເນຍ ພື້ນທີ່ລະດັບສູງທາງພາກໃຕ້, ໃນພາບຖ່າຍໃນວັນທີ 27 ກຸມພາ 2018, ໄດ້ມາຈາກສື່ສັງຄົມ. ພື້ນຖະໜົນທີ່ແຕກແຍກ ໂດຍແຜ່ນດິນໄຫວ ຂະໜາດຄວາມແຮງ 7.5 ສາມາດເຫັນໄດ້ ຢູ່ໃນເມືອງ ເຮລາ ຂອງປາປົວນິວກີເນຍ, ວັນທີ 26 ກຸມພາ 2018, ໃນພາບຖ່າຍທີ່ໄດ້ມາຈາກສື່ສັງຄົມ. ພວກຊາວບ້ານຢູ້ອ້ອມແອ້ມ ພາກັນລ້ອມບ້ານຫຼັງນຶ່ງ ທີ່ຈົມລົງໄປກັບດິນເຈື່ອນ ໃນເມືອງ ເມັນດີ ຫຼັງຈາກແຜ່ນດິນໄຫວຂະໜາດແຮງ ໄດ້ກະທົບຕໍ່ພື້ນທີ່ລະດັບສູງທາງພາກໃຕ້ຂອງເກາະ ປາປົວນິວກີເນຍ ຢູ່ໃນພາບຖ່າຍ ໃນວັນທີ 27 ກຸມພາ 2018, ເຊິ່ງໄດ້ມາຈາກສື່ສັງຄົມ. 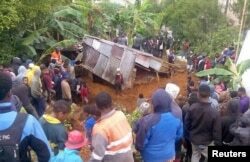 People in a remote area of Papua New Guinea are assessing damage froma powerful earthquake two days ago that one official said killed at least 15 people. Authorities fear the death toll could rise. 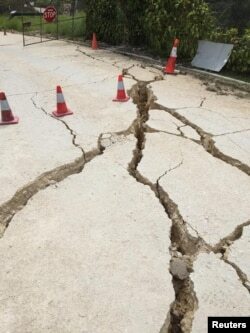 The quake, which hit about southwest of Porgera, has also disrupted the island's economic lifeline. "This is the key resources that PNG depends on. The LNG project and the two big mines. So it will have a huge impact." 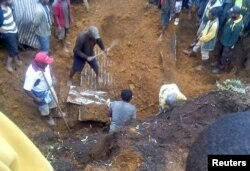 The governor said many roads remained cut off by landslides and that supplies would need to be airlifted. Australia's government said it was providing a plane to conduct aerial surveillance and provide logistical support.